The locksmith came to my flat in less than one hour and had sorted out the problem in less than ten minutes. I was quite stressed and he was calm and reassuring and instantly made me feel like I was in expert hands. A great job done, clean and efficient. Speedy, very professional, and super friendly service! We needed an urgent change of locks. Thanks to 24/7 London Locksmith, we had brand new locks, and multiple sets of brand new keys in a record-breaking time. Before leaving work i realized I forgot my keys in my flat and booked with Locksmith at 8pm. John came on time and he was absolutely lovely and got the job done in no time. He even advised me with tips in regards to locking up. Thanks John! I travelled from the other side of the country. It's Easter weekend. Saturday. I got to my place and could not find my keys. My heart dropped. I called 24/7 London Locksmith. Wow. He was here in thirty five minutes. He changed my front door lock in fifteen. fifty minutes from calling the locksmith and I am in my apartment writing this review to you now. It wasn't cheap but it never is when you're not expecting to spend money. I wasn't expecting to lose my keys either. This service was worth every penny. 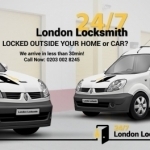 Thankyou 24/7 London Locksmith. I am very impressed by this company and the locksmith who came out within impossibly record time to do the job. I am very impressed by this company. I contacted them and the locksmith was with me within 25mins of the call. He did a tough and great job - and very importantly, he was very polite and courteous. I would highly recommend this company for your locksmith needs. For your information, the locksmith who came out and provided impeccable, polite and efficient service is Mr Daniel Pop. He is local to SW4 and very much recommended by me. I hope this review helps you.